Product #5803 | SKU D7 | 0.0 (no ratings yet) Thanks for your rating! 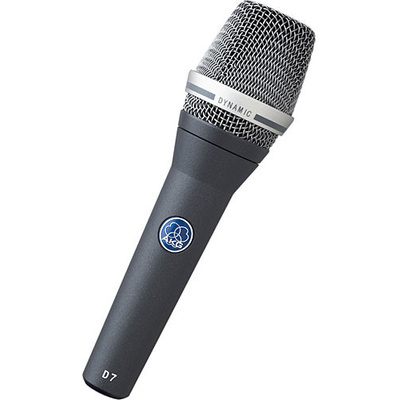 The AKG D7 Supercardioid Handheld Microphone is a suitable choice for general speech and performance capturing on stage, lecterns, desktops and anywhere a high-quality handheld microphone is needed. The dynamic microphone doesn't require any power and uses AKG's patented varimotion technology. The supercardioid polar pattern is most effective at rejecting off-axis ambiance, feedback and noise. Its rugged construction ensures years of solid operation and the microphone includes a windscreen, stand adapter and protective case. Varimotion technology provides a wide frequency response and excellent signal reproduction. The supercardioid polar pattern is most effective in minimising noise and feedback. The rugged construction ensures years of stable operation.